Industrial bimetal thermometer adopts a multilayer metal sheet as temperature-sensing element to control the pointer. The multilayer metal sheet is formed by two (or more) metal sheets that are laminated together. The element works on the principle that two different metal expand in different amounts when temperature changes. For example, there are two winded and ring-shaped metal sheets. One metal sheet expands with heat and drives the pointer to rotate, and then the instrument shows the temperature number corresponding to thermoelectric potential. 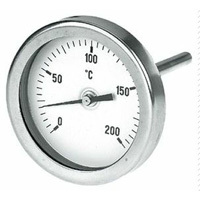 Bimetal thermometer is widely used in petroleum and chemical industry and other fields. And it is available in corrosive medium and conditions. Exact Instrument Co., Ltd is a professional manufacturer and supplier of bimetal thermometer, pressure gauge in China. Our company can offer OEM business according to clients' requirements.